1. Season tilapia fillets with salt. Dip each tilapia into beaten egg and then into bread crumbs. 2. Bake at 218°C for 10 – 15 minutes until golden brown. Set aside. 3. In a pan, turn garlic and onion until soft. Add ginger and the vinegar. Bring to a boil then add the vegetables. Thicken with flour (or cornstarch). 4. 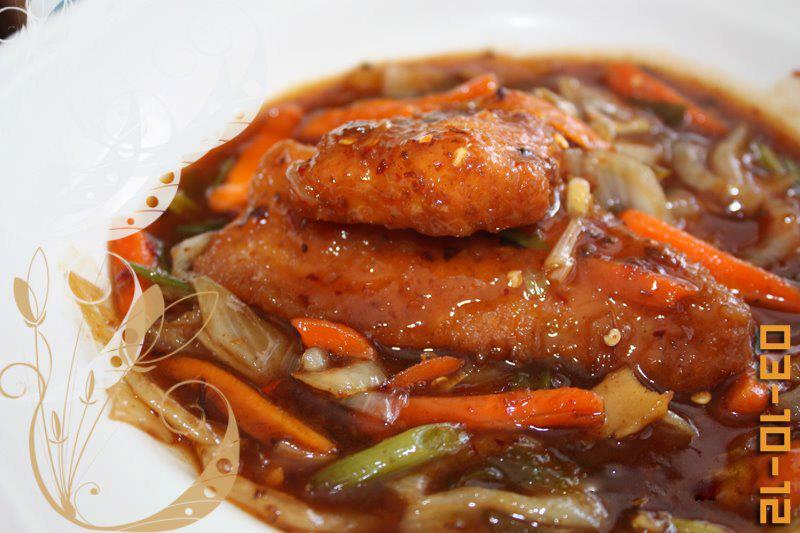 Place fish fillet on serving dish and pour sweet and sour sauce over while still warm. 5. To make a sauce, mix the vinegar, water, sugar and remaining salt and set aside. To thicken with cornstarch, dissolve 1 tsp cornstarch in 2 tbs water. Pour over boiling mixture and stir until thick.